Who doesn’t like nuts? They’re crunchy, fatty, nutritious, and convenient. They travel well. Tossing them into the air and catching them with your mouth is a fun way to impress any onlookers (this effect is enhanced if you sit in a chair backward at the same time). They even turn into butter. Nuts are the common bond between all dietary sects, it seems. Vegans love them for the protein. Ancestral eaters accept them, some begrudgingly. Weston A. Pricers have to soak, sprout, dehydrate, and ferment  them before they’ll even consider eating nuts, but in the end, they love them. Mainstream healthy dieters dig their “healthy fats .” Epidemiologists, squirrels, and birds laud them. They’re self-contained little morsels of instant edibility, good raw and roasted  alike. What’s not to like? I was hoping to get your take on phytic acid in nuts. If nuts are so good for us, and beans and grains so bad, but all three contain a good amount of phytic acid, what’s the deal? I like nuts. I guess what I’m really asking is: can I still eat them? Yes, it’s true. Nuts contain a lot of phytic acid, AKA phytate, AKA IP-6, AKA the storage form of a plant’s phosphorus, and antioxidant to the seed in times of oxidative stress (PDF ). When something that contains it is eaten, phytic acid binds to minerals like zinc , iron , magnesium, calcium, chromium , and manganese  in the gastrointestinal tract, unless it’s reduced or nullified by soaking , sprouting, and/or fermentation. Bound minerals generally cannot be absorbed in the intestine, and too many bound minerals can lead to mineral deficiencies. Animals who produce phytase – the enzyme that breaks down phytate – can thrive on phytate-rich foods. Rats, for example, produce ample amounts of phytase  and can handle more dietary phytate without exhibiting signs of mineral deficiencies. Since humans produce around 30 times less phytase than rats, phytate-heavy diets might be problematic for humans. So, 100 grams of almonds has between 1138 and 1400 mg of phytic acid. Walnuts have 982 mg, and 100 grams of Brazil nuts tops the list with over 1700 mg! Meanwhile, 100 grams of brown rice has between 840 and 990 mg, lentils have 779 mg per 100 grams, and oats contain just over 1100 milligrams. So what’s the deal? Why do nuts get a pass, while grains and legumes get condemned? First of all, grains  and legumes are generally seen as dietary staples. They form the foundation of meals. People don’t have a “small handful” of refried pinto beans (and not just because that’s an incredibly messy way to eat them) or “one or two” grains of brown rice. They eat plates of this stuff, they rely on them for protein and calories, and sure enough, cultures whose diets are based on (improperly prepared) grains and legumes often suffer the symptoms of widespread mineral deficiencies, like nutritional rickets . Nuts, on the other hand, are an adornment to a meal or a snack in between. A condiment. They are not meals themselves. And though I hear stories of people going Primal and subsequently going crazy with nuts, eating almond flour bread with every meal and downing a pound of pecans each day, I just don’t see it. I could be mistaken, of course. If I am wrong, and you guys are indeed eating large quantities of phytate-rich nuts every day, don’t do that. Keep it to about a handful (which is between one and two ounces, depending on the hand) per day. But my general sense is that people aren’t eating copious amounts of nuts. They’re eating some nuts in between meals, on those days when they just need a snack. They’re making almond meal pancakes once or twice a month (cause let’s face it – they’re kind of a drag to make and clean up after). It’s quite telling that all the studies looking at the effect of phytate on mineral bioavailability focus on grains and legumes , not nuts, because grains and legumes are what people are actually eating and relying on for nutrients. 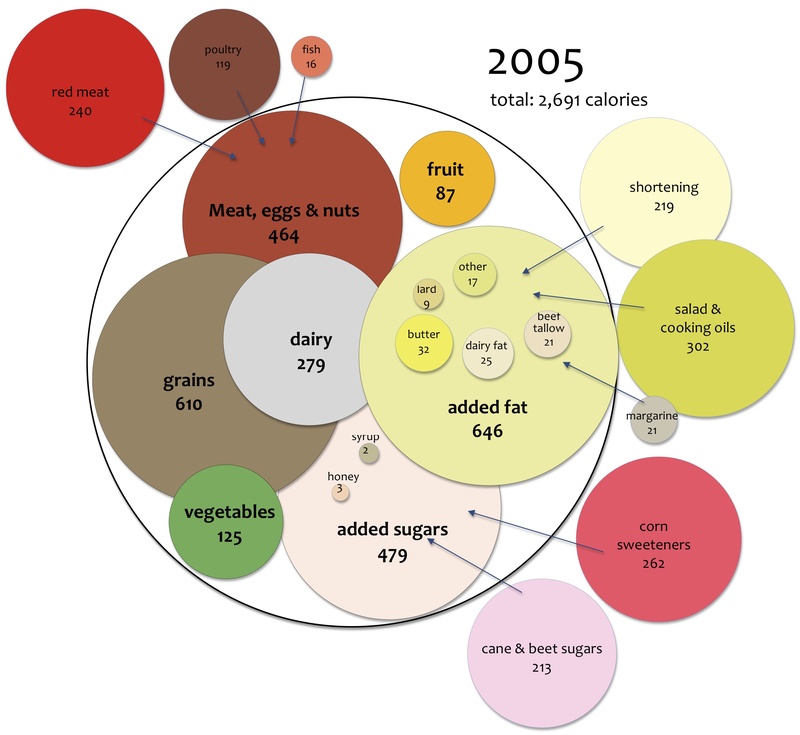 In 2007, the average American ate 610 grain calories and just 89 nut calories per day . I strongly suspect those numbers would look a little different for a Primal eater, but my point stands: you don’t see any studies examining the effect of almond intake on mineral bioavailability because nobody’s relying on almonds for their nutrition. Second, those figures are for “phytate per 100 grams dry weight.” 100 grams of almonds is a little different than 100 grams of brown rice in the real world, on your plate, and in your mouth. The brown rice is about 362 calories, while the almonds are 575 calories. You’re far more likely to plop 362 calories of brown rice  onto a plate and go back for seconds than you are to eat almost an entire cup of almonds in a sitting. 100 grams of rice is a standard meal; 100 grams of almonds is veering out of “snack” and into “meal” territory. Is there an “ideal” way to eat nuts with respect to the phytic acid content? Although asking “What would Grok do?”  doesn’t give us definitive prescriptions for what we ought to do, it can be a helpful starting point. How would our ancestors have eaten nuts? By the plastic shrinkwrapped pre-shelled and salted bagful? Or by the laboriously gathered and hand-shelled occasional handful? Eating nuts is effortless now, but it wasn’t always like that. Ever crack a macadamia shell by hand? A Brazil nut? An almond? It’s hard work. You’re either trying to break open a rock-hard shell or sifting through fragments of shell and nut to find something edible. If you eat your nuts like you had to gather and shell them yourself – rather than gorging on them by the handful – you won’t be able to consume a significant amount of phytic acid. If you’re still worried about phytic acid from nuts, you can play around with food timing. In order for phytate to impair absorption, it has to physically come into contact with the minerals in question. Since mineral absorption – or non-absorption caused by phytate chelation – happens in the gastrointestinal tract, that wild and crazy place where masticated and partially digested food particles gather, mingle, and sometimes pair up, keeping the food in your gut away from the phytic acid in your gut by eating the nuts separate from other foods might improve your mineral status. The minerals in the foods with the phytic acid will presumably be affected, but the impact on other sources of minerals should be reduced. Eat your nuts apart from other sources of minerals. Sorry, those Brazil nut-crusted oysters , while delicious, might be a bad idea for zinc absorption. This is in stark contrast to the way most people eat their phytate. The average person out for Mexican food, who eats grains and legumes with relish, is having four corn tortillas (448 mg phytate) with a small scoop of refried beans (622 mg) and some brown rice to, ya know, be healthy (990 mg). He throws in a few hefty slices of carne asada, but the combined 2060 milligrams of phytic acid for that meal will impact its overall mineral contribution. The average Primal person, who avoids grains and legumes, has an ounce, or a small handful of almonds as an afternoon snack (350 mg phytate) with a couple Brazil nuts (171 mg) for the selenium. Being snacks, they’re separate from his meals. Being separate from his meals, the antinutrient effect of the phytate on the other minerals is lessened. If he bumped that up to 100 grams of each nut for over 3000 mg of phytate and over 1200 calories, then, yeah, he’d have a phytate problem (and an omega-6  problem). But he’s not doing that. Unless you’re a Hadza , you shouldn’t be relying on nuts for the bulk of your nutrients and calories. And that’s the important thing: you don’t have to, nor are you compelled to, because the Primal eating plan is an overall nutritious one, full of mineral-rich vegetation, animals, and yes, the occasional handful of nuts. You’re not relying on plant foods for your zinc – you’re eating shellfish and beef and lamb for the far-more-bioavailable animal-based zinc . According to the evidence I was able to find, phytic acid simply isn’t a major concern in the context of a nutritious diet, especially one that contains ample amounts of animal-based minerals  and protein. Phytic acid can inhibit calcium crystallzation and reduce kidney stone development . If you have hemachromatosis – a tendency to absorb too much iron – you actually want to reduce your iron absorption, and dietary phytic acid can (famously) do just that . It’s also one of the only iron chelators that does not induce lipid peroxidation or the formation of reactive oxygen species (PDF ). If you’re trying to absorb more iron – maybe you’re pregnant or anemic – taking some vitamin C with the phytic acid will inhibit its iron-binding ability  (PDF). Phytate may also be an effective anti-cancer agent  with the curious tendency to ignore the healthy cells and focus only on the cancerous  ones. So to answer your final question, yes, I’d say you can definitely eat and enjoy nuts in moderation, an ounce or two (especially soaked ) as long as you’re eating an otherwise nutrient-dense diet. Thanks for reading, everyone. Be sure to leave your thoughts in the comment section.